Touring Gadget Factory is a workshop created and delivered by Edinburgh Science and supported by Siemens, as part of a three-year sponsorship plan. 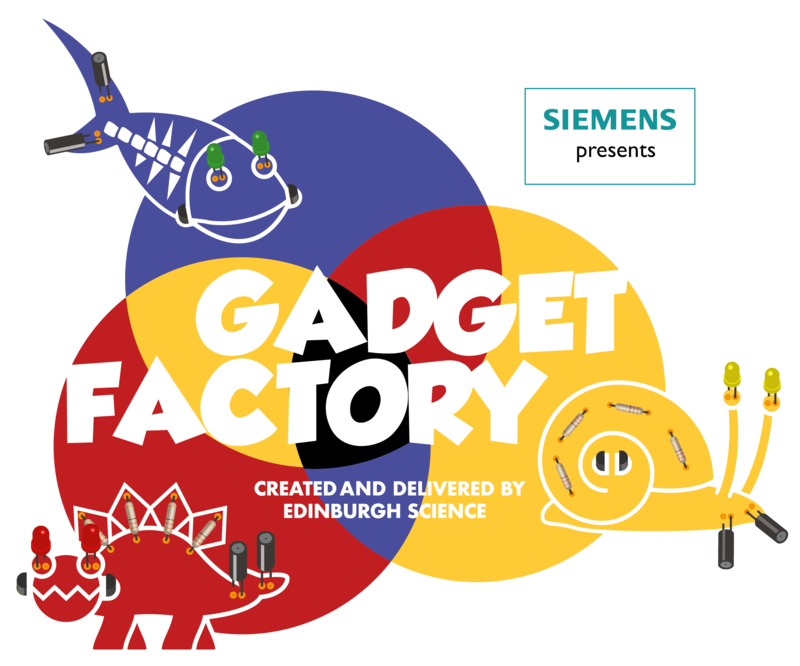 In year one Touring Gadget Factory visited four events across the UK and, together with Siemens volunteer staff, Edinburgh Sciencel staff delivered the workshop to 746 young people aged 8–14 years old. We had a fantastic time at The Big Bang Fair in Birmingham in March, Manchester's MakeFest in May, at the Festival of Design and Engineering at University of Bournemouth and delivered seven days of workshops at the Great Exhibition of the North in August. Surveyed attendees gave Touring Gadget Factory either an eight, nine or ten out of ten for enjoyment, with 99% saying it would increase their interest in a career in engineering. The Gadget Factory workshop enables young people to investigate and explore how everyday gadgets work and provides the chance to build their very own gadget. After grasping the basics of creating an electronic circuit, participants then pick their electronic components and use their skills to assemble their very own working electronic gadget to take home. After learning the secrets of soldering there is no end to the gadgets that can be made! Attendees will learn gadgets are made from a combination of different components, identify the danger of electricity and how to use it safely, understand and describe how a circuit board works and gain knowledge of the functon of batteries, capacitors, LEDs and transistors. To learn more about electronics and engineering and try some great activities at home! Touring Gadget Factory will be in Birmingham at the Big Bang Fari 13–16 March 2019. Book tickets here. The Curiosity Project is Siemens’ UK–wide engagement programme, aimed at inspiring young people and bringing science, technology, engineering and mathematics (STEM) to life. The UK is great at engineering, but there is a problem: there aren’t enough young people studying STEM and becoming engineers. As an engineering company, it’s in our interest to do something about that! You can get excited about the world of engineering by visiting science museums and festivals where you can meet real engineers, or you bring science to the kitchen table and discover the wonders of science and engineering with our ‘DIY Science’ videos on Youtube! For schools, we have an extensive education programme , providing free, stimulating and curriculum-linked resources that bring STEM education to life. Find out more about the Curiosity Project or discover how to be an Education Supporter with Siemens.